I think this hacking tutorial, Log in Windows Without Password with Kon Boot, will be easy to follow using the step-by-step instructions. The purpose of this tutorial is to demonstrate the importance of physical security and explain how to prevent this kind of attack. Three or four days ago I watched a BBC program about spying. In the episode, they showed how a spy device can be put silently on your motherboard, again… physical security is very important. For most people, it wouldn’t be a big deal because we carry our computer wherever we go, but it could become a big problem for firms who have lots of important data on employee computers. Physical security describes security measures that are designed to deny unauthorized access to facilities, equipment and resources, and to protect personnel and property from damage or harm (such as espionage, theft, or terrorist attacks). Remember: Do this only on your own computer, make sure you are not harming others. 1. First, we will make Kon Boot bootable from the USB drive by using the default Kon-boot installer that is provided when we buy this program. If we use the free version, we can create the image by following the tutorial: How to Create Bootable USB. We will choose the USB we want Kon-boot to be installed on and select it from the “available USB drives” drop-down list. Then click, “Install to USB stick”. 2. Now that the Kon-boot USB is ready, we need to configure the BIOS settings and change the boot order so we can boot from the USB. You can view our previous tutorial about changing BIOS boot order in step 5. 3. This is displayed when we successfully boot from the Kon-boot USB. 4. After the Kon-boot initialization screen it will normally boot to Windows. When we press the SHIFT key 5 times (sticky keys), we can see that the command prompt pops up with system role. 5. We can enter Windows without a password, just click the arrow and we are inside the system. 1. Create a password for your computer BIOS. 2. 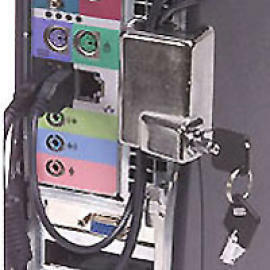 Lock your computer physically to prevent someone from opening the computer case and resetting the BIOS password.